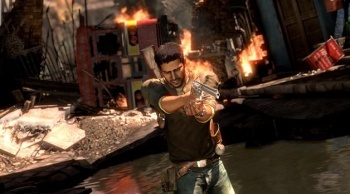 Uncharted will return in 2011, but not in videogame form. Playing through the Uncharted games is fun, but can you imagine being able sit back, relax, and read one? I'm serious, fans may soon be able to get rid of that pesky controller and enjoy an Uncharted novel while sitting by the fireplace or outside on a hammock amongst the falling autumn leaves. Del Rey Books has announced that it'll be expanding the adventures of treasure hunter Nathan Drake through a novel called Uncharted: The Fourth Labyrinth. It'll be written by Christopher Golden, the author of multiple Hellboy novels, Buffy the Vampire Slayer novels, and Bloodstained Oz. Uncharted: The Fourth Labyrinth will follow Drake in a completely new adventure that has him searching for the labyrinth of Daedalus. In mythology, a tale exists of an incredibly deadly and intricate labyrinth built by a man named Daedalus to hold a Minotaur. Drake himself might not go up against a Minotaur, but he'll probably face plenty of deathtraps and eventually find some kind of shiny bauble. The book is known to take Drake to both the ruins of Crete and a secret crypt in the heart of China. Exactly what he's searching for and who'll be trying to get to it first is unknown, but chances are good that Drake will have plenty of competition and speed bumps in his way. The novel should serve to tide over action-adventure fans that also like to read until Uncharted 3 is eventually announced, which has only been spoken of in shaky rumors so far.